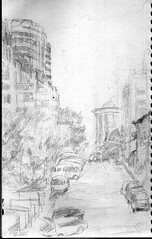 leobro – nice corner sketch of Pike’s Place. Tyler Street – Very vibrant flowers! That’s a new record, right?! Great job. littlefish – nice piano man on Pike! gabi – Not only one Public Market sketch, but two! Fantasic!!! Finishtag – Great vibrant palette of colors. melanzane – nice compositions. They’re like snap shots of your day. Thank you to all of you who offered help with image reduction techniques. What beautiful work and thoughtful words by all of you!!! Here are my more appropriately-sized bits! Last edited by beth on Sun Jan 11, 2009 3:50 am, edited 1 time in total. Leobro - Great job on the market!! I love balloon man! 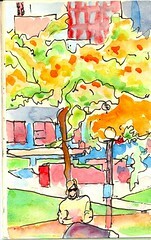 Tyler - Nice colorful market sketches!! Joanna - Love the details on your tall colum and all the fruit! Littlefish - Great sketches of the people!! Gabi - Wow!!! Wonderful sketches of the market. I enjoyed your comments on the page. Finishtag - Nice colorful sketch!! Melanzane - Great sketches. I love the one of the ferry!!! Good work by all of you. It must be fun to have a sizeable group! Some real nice stuff from Seattle. Lovely architectural drawings, Gabi. thank you all for the nice comments! go Seattle!